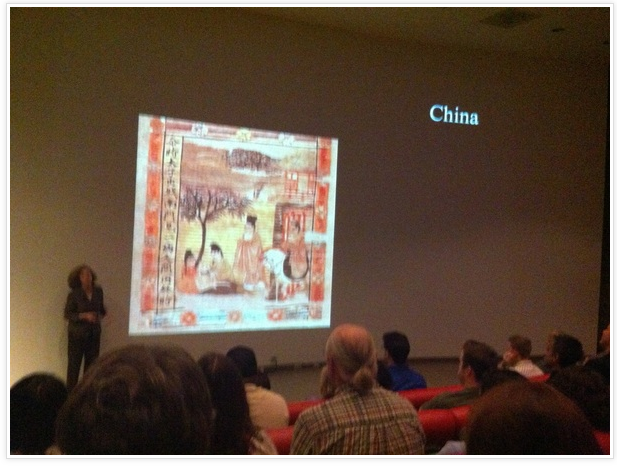 At the Dallas Museum of Art today Dr. Monica L. Smith of UCLA gave a very good presentation about her studies associated with the origins of Buddhism, a religion/philosophy I’ve never really studied, and in her presentation, I was intrigued to find out how it spread throughout Southeast Asia over time and how it got localized as it moved from one country to another. As I thought about it, I began to wonder if this same practice hadn’t happened with the development of iconic ancient sites around the world, like the building of pyramids. 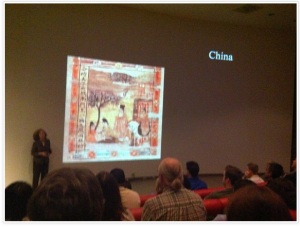 During the event, co-sponsored by the Archeological Institute of America, Dr. Smith showed photos of how Buddah, once people began drawing him or creating icons to show him, they adopted their own ethnocentric identity to him–he kept much of the same pose and aura, but his head gear, or eyes, or facial shape etc. modified to reflect a stereotypical representation of the country where he was being worshiped. Which gets me back to wondering about the whole premise that started the Wonders Expedition to begin with. Can’t the use of pyramids in different cultures, countries and even continents be looked at the same way? I mean the Egyptian pyramids are built the way the Pharaohs preferred. At Lower Jackson Mound in Epps, Louisiana, they didn’t have limestone so they simply used dirt. 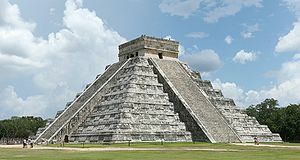 The Maya built pyramids but changed the design to meet their style of architecture. 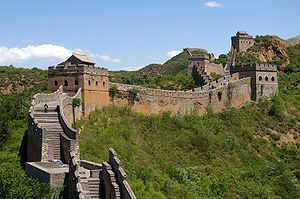 The Chinese, yes, there are pyramids in China, built theirs sort of like the Egyptians, but like Native Americans, they simply used dirt. Temples in India largely are built in pyramidic form as well. One of my good friends, a scholar, says that pyramids are “just a pile of rocks and anyone can build a pile of rocks!” But to me, there still appears to be something more to them to me than just a pile of rocks. What are your thoughts on the matter? Do you think there was some cross-culture communication going on about the building of these incredible structures? 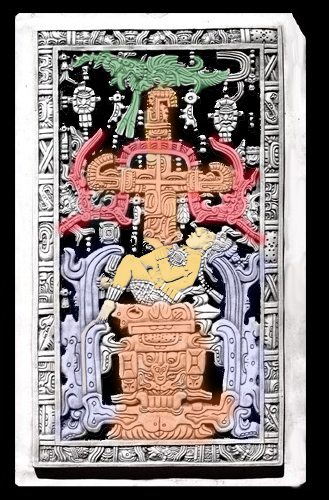 The image is based on the sarcophagus cover of Pakal’s tomb in Palenque, Mexico and since the 1970s has been the red meat, smoking gun of the UFO fringe to support Ancient Astronaut Theories. I even tweeted that night that Giorgio and the producers of Ancient Aliens deserved credit; the 3D model the Lucas Films designer made looked pretty darn cool–of course it did, he works for Lucas Films. The problem is of course, it’s ridiculous when you place it in actual context to what’s on the cover of Pakal’s tomb. 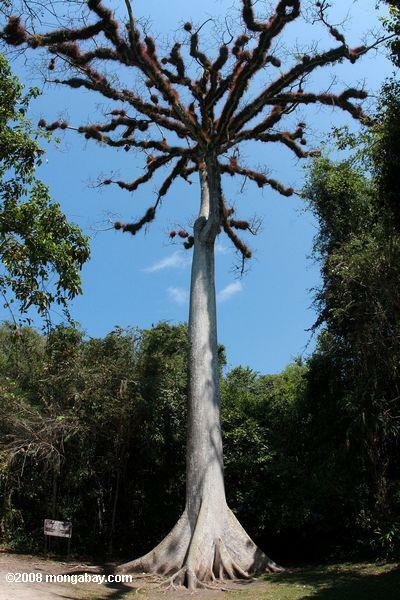 The Ceiba Tree of South American origin is a pretty unique looking tree. It also has been found in Southeast Asia, but it’s primary interest here is its use in Pre-Columbian MesoAmerican mythology where it was incorporated into beliefs associated with “The World Tree” and how it connected the heavens, the earth and the underworld all in one fell swoop. Just the root system of the tree is pretty amazing and curious. But it’s branches tend to grow out horizontally at 90 degree angles from the base of the trunk and in many an ancient drawing, etching, stone carving, sarcophagus cover, it’s pointing in the four cardinal directions of north, east, south and west. Such is the case clearly depicted on Pakal’s tomb cover. To the right, I’ve posted a colored drawing for your own assisted observations. So what do we have here? Well, in green, I’ve colored in what appears to be a rather large bird sitting atop the tree. In orange below is the actual Ceiba tree. Notice the branches of the tree pointing out at 90 degree angles? In red is clearly a two-headed snake, with a symmetrical head appearing on both end of the snake. Apparently, this was a quite-often-featured type of snake and it usually signified the birth of some new form of something happening. Good grief, Charlie Brown! And Snoopy could fight the Red Barron from atop his doghouse. Below Pakal in the drawing to the right is the base of the Ceiba tree. Von Daniken says the texture at the bottom of the tree is fire coming out of the engines of the spacecraft. The Lucas Film model maker actually put rocket cones on the model displayed in the TV show. It is just this sort of distortion that takes place in shows like Ancient Aliens that those none-the-wiser fall prey to. Here at The Wonders Expedition, over the next few years, we are going to investigate hundreds of sites around the world and help the public by showing them nonsense like that depicted on Ancient Aliens is ridiculous and shameful. It’s one thing to do things in a light-hearted manner in the guise of entertainment, but it’s also another to sit there in front of a camera like Childress, Daniken and Tsoukalos do and clearly misrepresent the truth. Add this other thought, too: What ruler in present day society do you know, as well, who if they did have access to a spaceship, would be the one sitting at its controls? Does President Obama fly Air Force One? It’s just as nutty to think that King Pakal more than 1,000 years ago also would have been the one to fly an ancient spacecraft isn’t it? I mean, seriously. He was the king of his people. Wouldn’t an ancient ruler, if he had had access to such sophisticated travel also have been sophisticated enough to build in a space for him to ride as a passenger and not as the actual pilot? Seriously?